As Bill Gates sees it, there are three main threats to our species: nuclear war, climate change and the next global pandemic. Some scientists are now using computers to do just that. Despite the availability of the flu shot, the World Health Organization reports that seasonal influenza is still responsible for millions of serious illnesses and as many as half a million deaths per year globally. The partial efficacy of each year’s flu shot, coupled with long manufacturing times and limited global availability, suggests new flu-fighting methods are still needed. And that’s just for the seasonal flu. Pandemic influenza, like the devastating 1918 Spanish flu, could again kill tens of millions of people in a single year. Antibodies, a natural part of the immune system, are front-line soldiers in the war against viruses. The job of an antibody is to recognize and physically adhere to a foreign invader like influenza. Human antibodies are bivalent, meaning they have two hands with which they can grab onto their target. 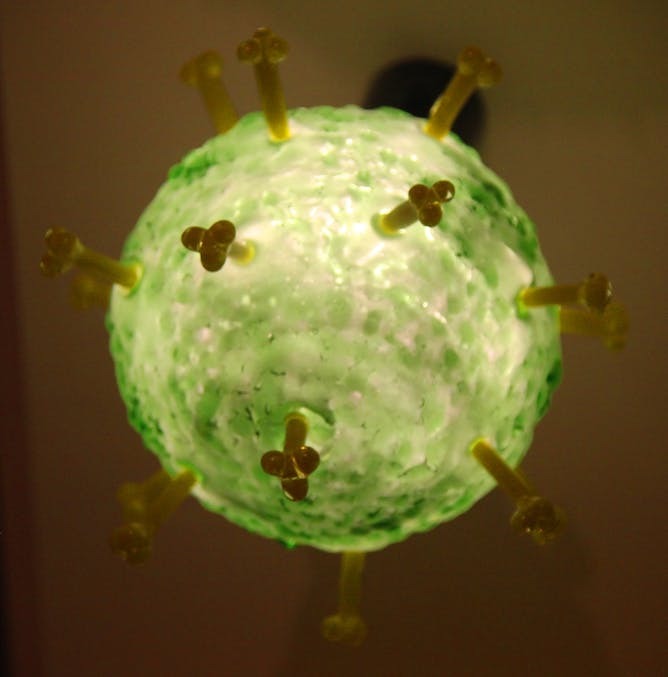 A glass model of an influenza virus hanging in the Smithsonian National Museum of Natural History. Under a microscope, influenza looks like a tiny ball with spikes. It uses some of its surface spikes to break into human cells. By grabbing tightly to those spikes using one or both hands, antibodies can prevent flu particles from infecting human cells. 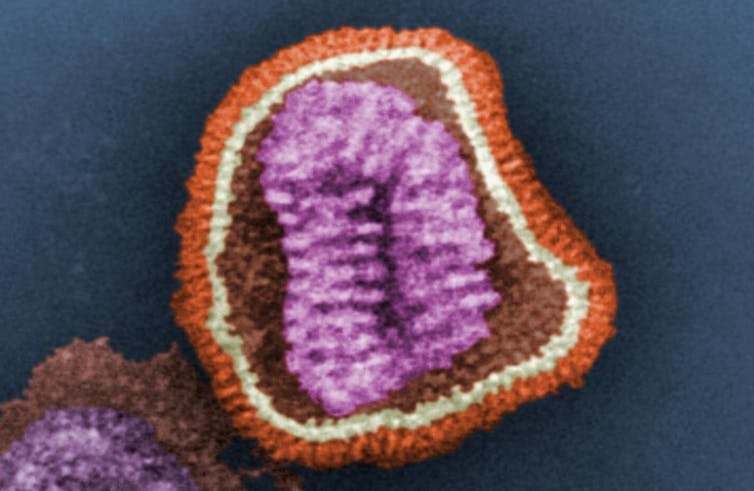 But every year the rapidly evolving influenza picks up mutations in its spike proteins, causing the sticky hands of our antibodies to no longer recognize the virus. Researchers have long sought a universal flu vaccine – one that doesn’t need to be readministered every year. Efforts to produce one tend to involve injecting noninfectious flu lookalikes in hopes that it will prime the immune system to mount a proper attack on whatever real strain of flu it sees next. Despite some progress, researchers have not yet been able to coax the immune system to defend against all strains of influenza, and the threat of a global pandemic still looms. Transmission electron microscopic image of an influenza virus particle. Computational protein design offers another way. Rather than relying on the immune system to generate an antibody protein capable of shutting down a virus like the flu, computer modeling can now help quickly create custom antiviral proteins programmed to shut down a deadly virus. Unlike a vaccine, this class of drug could be administered to treat an existing infection or given days prior to exposure to prevent one. And because these designer proteins work independently of the immune system, their potency does not depend on having an intact immune system – a useful trait, as those with weaker immune systems are at high risk for viral infection. Computer-generated antiviral proteins work the same way some natural proteins in our immune system do. By having surfaces that are chemically complementary to their targets, antiviral proteins can stick tightly to a specific virus. If a protein sticks to a virus in just the right way, it can physically block how that virus moves, ultimately preventing infection. By designing an antiviral protein on a computer, building it in the laboratory and then administering it into the body, you effectively digitize part of the immune system. In 2016, computer-generated proteins were shown to be more effective than oseltamivir (Tamiflu) in warding off death in influenza-infected mice. One dose of designer protein given intranasally was more effective than 10 doses of Tamiflu, a drug considered an “essential medicine” by the WHO due to its antiflu activity. What’s more, these new computer-generated antiflu proteins protected mice against diverse strains of the flu. Efforts to turn these promising results into FDA-approved drugs are underway. In a just published paper in Nature Biotechnology, scientists here at the Institute for Protein Design at the University of Washington went a step further and demonstrated a new way to shut down the flu: They used computer modeling to build a completely new kind of antiviral protein with three sticky hands. Why three? It turns out many deadly envelope viruses – like influenza, Ebola and HIV – build their spike proteins out of three symmetric parts. A single antiviral drug with three properly spaced hands should be able to symmetrically grab each part of a spike protein, leading to tighter binding and overall better antiviral activity. This geometric feat is beyond what the human immune system can naturally do. Left: The tips of many viral spike proteins are built out of three symmetric parts, with one part highlighted in pink. Right: A new three-handed antiflu protein (blue) bound to influenza’s HA spike. The design strategy worked. The best three-handed protein, called Tri-HSB.1C, was able to bind tightly to diverse strains of influenza. When given to mice, it also afforded complete protection against a lethal flu infection with only minimal associated weight loss – a trait commonly used to diagnose flu severity in mice. Researchers are now applying the same tools to the Ebola spike protein. It will be many years before this new technology is approved for use in humans, for any virus. But we may not have to wait long to see some lifesaving benefits. By coating a strip of paper with a three-handed flu binder and applying influenza samples on top, the same team was able to detect the presence of viral surface protein even at very low concentrations. This proof-of-concept detection system could be transformed into a reliable and affordable on-site diagnostic tool for a variety of viruses by detecting them in saliva or blood. Like a pregnancy test, a band on a test strip could indicate flu. Or Ebola. Or the next rapidly spreading global pandemic. When a global viral pandemic like the 1918 Spanish flu strikes again, antivirus software of the biological kind may play an important role in saving millions of lives.